We begin our tour in the inner streets of Fitzroy, a suburb with so much street art, you are completely forgiven if you detract from this tour for a few minutes to check some of it out. Ishka is a clothing, jewellery, furniture, and other cool things company that trades in diverse hand made crafts, both local, in Australia, and international, primarily India. Ishka commissioned female graffiti artist Deb to paint many of their delivery vans with some of her signature pieces; women of colour, with pastel coloured backgrounds and hair, and prominent, almond shaped eyes. 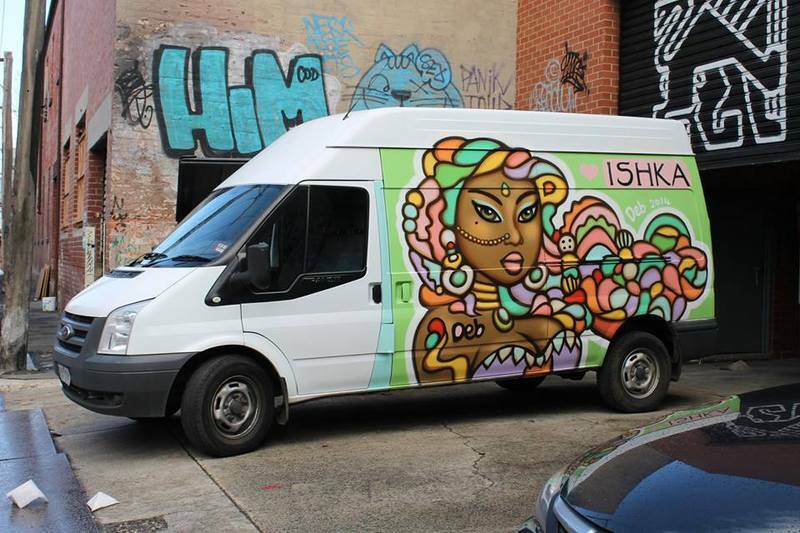 This van, completed in August 2014 is just one of many Deb has worked on for Ishka, and represents the mutual relationship in commissioned art for business. This is great advertisement for Deb’s work, given that Ishka is a large and popular company, but also because her art is on a mobile object, garnering her more advertisement than something painted on a wall in an alleyway. It is also great for Ishka because not only are they promoting their company through beautiful artwork, they are also adding street cred to their brand by using graffiti, while also adding to the value they as a company place on local, handmade and unique crafts. “Stop 1,” Street Art deTours, accessed April 24, 2019, http://streetartdetours.com/document/1176.